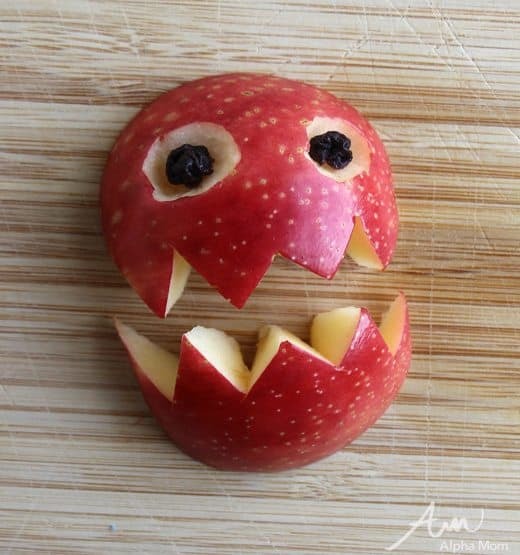 In the lead up to Halloween, it’s nice to have an healthy snack in your repertoire. 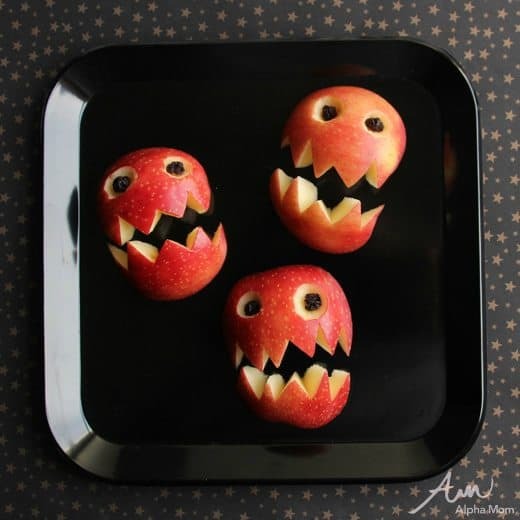 These apple monsters are quick to put together and they are fun for a pre-trick-or-treat snack or lined up on a tray for a Halloween party. The ingredients for this snack couldn’t be simpler and I’m guessing you have them in your house right now. 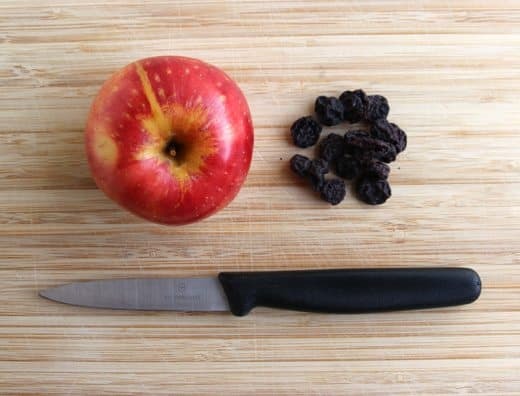 To make it, you’ll need an apple, a few raisins and a paring knife. That’s it! Next, you’ll cut the monster’s mouth. I like to make my cut about 2/3’s of the way down so the top piece is a little bigger than the bottom piece. 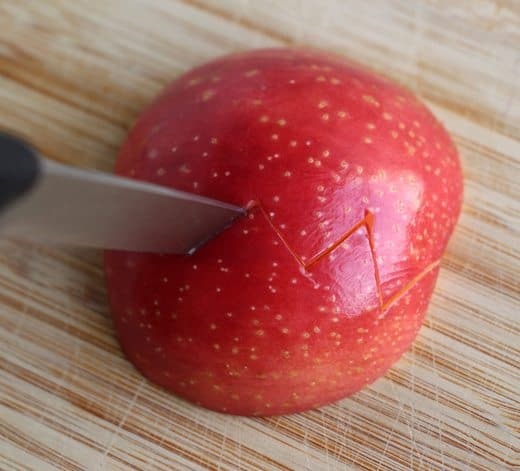 Using the tip of the paring knife, cut straight down through the apple in a zigzag line. If you make some of the points taller, some shorter, some skinnier and some fatter it makes the monster look scarier so get a little crazy. Separate the two halves and clean up any rough edges so the points of the mouth are nice and sharp. Next you’ll cut eye sockets. 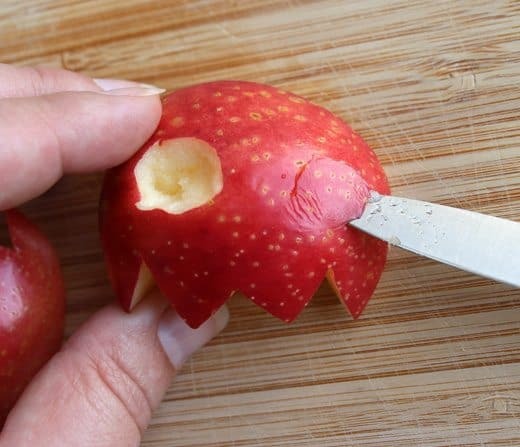 Stick the point of the knife into the apple and rotate it to cut a cone shape — sort of how you would core a tomato. Put a raisin into each hole for the pupils. You might want to cut the raisin in half if it’s really large. If your apples are going to sit for a while before they’ll be eaten there are a few steps you can take to keep them from browning. 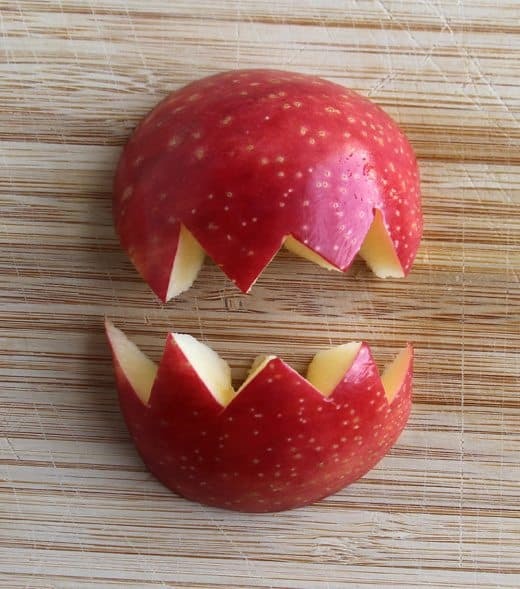 I’ve found that using a really sharp knife to cut apples keeps them from turning brown so quickly. You can also dip the apple chunks in pineapple juice or a bowl of water with some lemon squeezed into it. 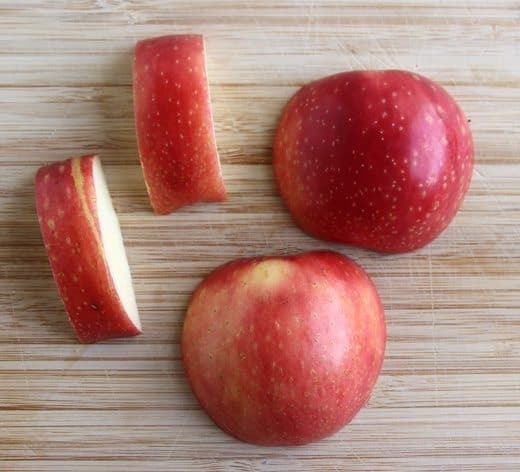 Alternatively you can select an apple variety that is slower to turn brown such as Gala or Cameo.